Enjoy undisturbed music come sun or rain. 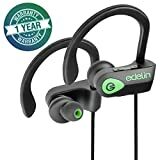 Get these top 10 best waterproof headphones in 2019. Grabbing a pair of waterproof headphones doesn’t sound a bad investment. Especially for sports and music enthusiasts, where the two are inseparable and finding the best waterproof headphones is inevitable. It is better to be safer than sorry if you want to enjoy music near some water. 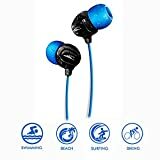 Whether you want to do biking, diving, skiing or do any other exercise in those harsh weather, you will need an efficient waterproof pair of headphones. Choosing the best waterproof headphones can be a hard task especially if you don’t know about the best brands and the supported features. We’ve taken enough time to find the best waterproof Bluetooth headphones available, on the market in 2019. 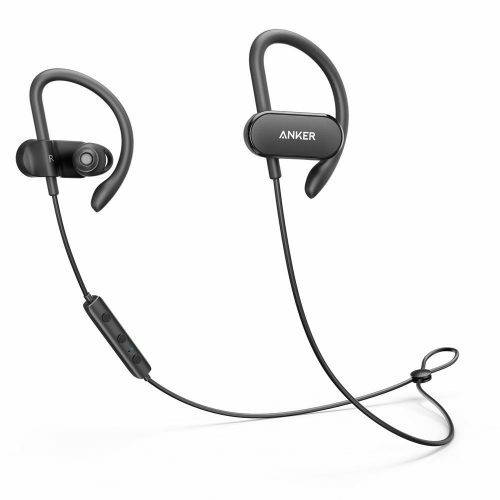 Finding reliable waterproof headphones isn’t easy but Anker sound buds wireless waterproof headphones is a reliable option. They are loud and clear and boats aptX high-resolution music, thanks to the noise canceling technology that eliminates ambient noise to deliver outstanding sound clarity. These headphones are tailored just for you to ensure that you enjoy the most. The ear tips are customizable to allow perfect fit every time you wear them. This customization feature of the ear tips is of particular importance during workouts. The headphones operate for 12.5 hours on single charge, and 10 minute charge time allows one hour of continuous use. Besides, it is made to handle all weather elements. Thanks to the hard and durable outer shell plus the hydrophobic Nano coating that enhances protection against sweat and water. Due to this customized design, it is possible to listen to music when it is raining without causing any malfunctioning. 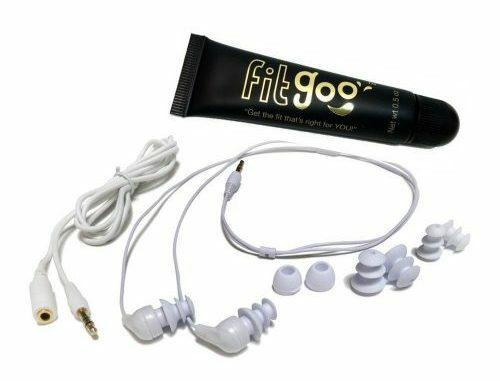 The package of these waterproof headphones features multiple ear tips which are made of silicone and memory foam, cord management clip, ear wings, micro USB cable and other essential components. Moreover, it comes with a PU leather carrying case with an aluminum carabineer for secure attachment. 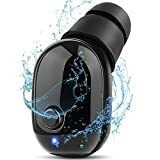 SHUHUA Bluetooth headphones are among the best performing waterproof headphones. So, these are made for anyone who likes to engage in outdoor exercise yet cannot leave behind the music stereo. They boast a secure fit and ipx7 waterproof technology. Thanks to the ergonomic design which features Nano coating and adjustable ear hooks for customized fitting. They are also great for gym use since the ear tips are sweat proof, thanks to the incorporation of IPX7 waterproof technology. Apart from the gym, you can still listen to music as you engage in jogging, cycling, hiking and other impact sports. They also feature the latest Bluetooth technology, version 4.1 CSR which is incredibly efficient. And for incredible sound quality and unmatched bass, they feature premium quality and state of the art acoustic components enhance excellent sound quality with clear treble and deep bass. It has a super powerful battery working time of 9 hours on full charge. So, you can engage in long workouts as you get in touch with your favorite music without any hurdles. Besides, the power indicator light will inform you when the battery is running low and get ready to recharge it. These Bluetooth headphones support clear speech at a distance of 10 meters giving you all the convenience you need during workouts. Sometimes you’ve to answer a call when showering or bathing, but it is quite challenging if you don’t have waterproof headphones. However, XQ HD headphones are the best since they have Bluetooth feature and are 100 percent waterproof. So you don’t have to carry your phone into the shower room since you can pick calls remotely through Bluetooth connectivity. You can use this device even after dipping them in water. Thanks to the state of the art design that ensures great functionality without letting water to penetrate into the vital components of the headphones. Besides, it has a long distance of transmission range. It uses 70 mAh lithium-ion polymer battery that has unsurpassed operation time. While adopting noise elimination technology seems to be inevitable features these Bluetooth headphones can eliminate ambient noise to enhance excellent sound clarity. With the provided micro USB charging interface, it only takes a matter of minutes to recharge this device. For versatile functionality, you can answer calls, play music, change volume and do other tasks with a click of a button. 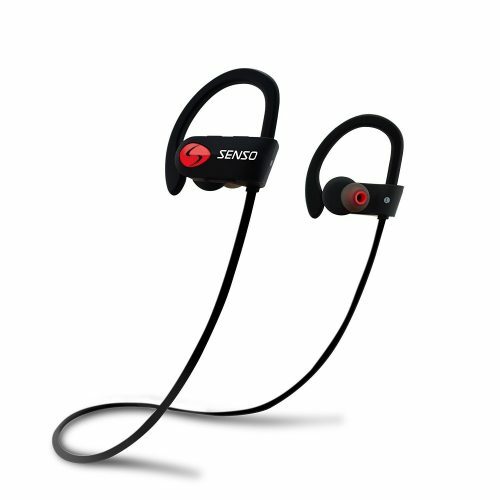 SENSO sports Bluetooth headphones feature an innovative design that is waterproof and compatible with two phones. It can connect to all Bluetooth enabled devices giving you the freedom to enjoy music from an assortment of music devices. It has special components that enhance passive noise cancellation to give you superb sound quality. The Bluetooth range is about 30 feet which allows you to enjoy music as you engage in sporting exercises without necessarily carrying your device around. Apart from being cordless, these wireless headphones feature an ergonomic design that looks stylish in any environment. Hands-free control is yet another adorable feature that enhances comfort as well as the convenience of use. You can remotely add volume, pause, skip the song and do other common functions. For incredible waterproofing, the construction boats IPX7 waterproof and sweat-proof technology. It is economical Bluetooth headphones that deliver unparalleled solid bass and ultra-crisp treble, giving you a revolutionized way of enjoying music in any condition. And charging the device is as simple as eating a cake, thanks to the provided micro USB port and cable. Charging takes a maximum of two hours, allowing you to listen to music effortlessly and without fear while undertaking any sports activity. Simply as the product title suggests, these headphones are specially designed for use in moisture conditions. Through the incorporation of waterproofing technology and state of the art acoustic features, you have every reason to use these devices in watery conditions. You can even take a shower as you listen to the best rock star music. Firstly, the devices use superior sound quality components to enhance premium audio quality underwater. It produces premium bass and awesome treble to make the music feel better than the original format. 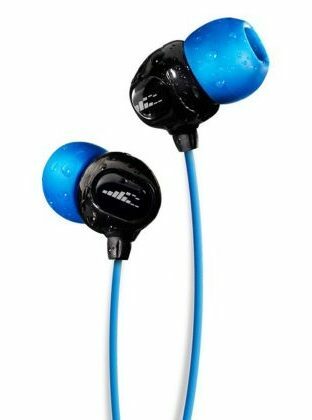 These 100 percent waterproof stereo earphones are ergonomically made to withstand outstandingly heavy perspiration. 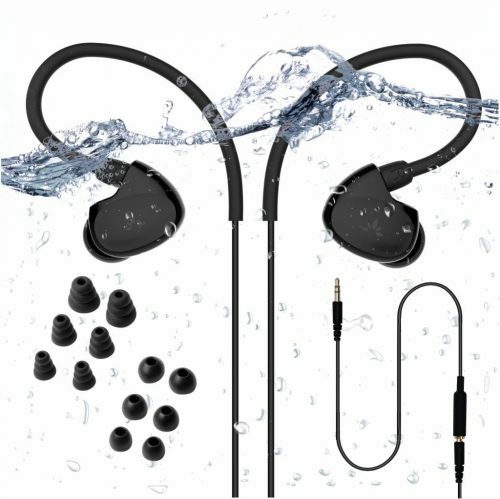 It has a rating of IPX8 rating, meaning that you can submerge them in water to a depth of 12 feet and still enjoy crystal clear sound quality. The innovative design focuses on the needs of all athletes. Thanks to the ergonomic ear shape that sits flush on the ear with incredible ear alignment so that you can engage in all moves without them falling off. The design encompasses five sets of high-quality earplugs and a tree tip to enhance secure fit on your ears. 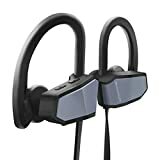 They are among the most adored Bluetooth headphones to use in the gym, biking, swimming, snowboarding, running and any other scenario where there is a likelihood of encountering moisture. SWIMBUDS waterproof headphones feature a state of the art design that delivers the best functionality and is incredibly durable. Hence, they are among the best headphones for use by sportspersons. It features golden-plated jack to prevent corrosion in case there is a moisture contact. 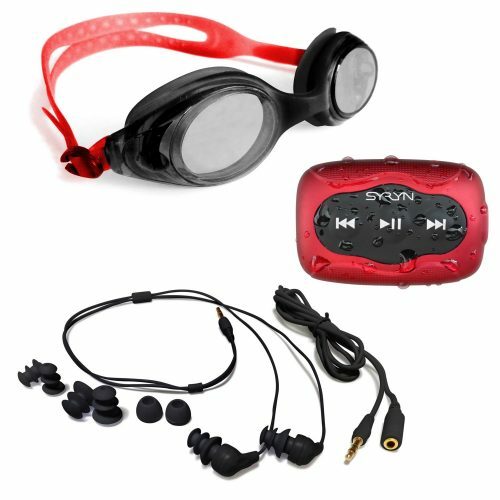 They are ergonomically designed to allow you to wear swim cap and goggles without stuffing long headphone cords. Also, the audio extension cord is waterproof to allow longer fit and still enhance waterproofing capability of the headphones. 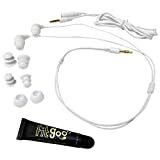 With a total of four earbud tips available, you can easily find your best suit. The swim buds Earbuds boasts waterproof seal that allows sound in without any water percolation. These Earbuds features a state of the art design that allows comfort of use, unparalleled sound quality and also enhances a stylish look. The use of these premium quality Earbuds enhance less drag and eliminates any loose cords that could get stuck in gear or moving parts. Avantree waterproof headphones gain a formidable reputation in sporting activities since they are highly-performing and are universally compatible. They are compatible with all audio devices as long as they have a jack port. And, the Earbuds feature an ergonomically designed waterproof seal to allow comfortable use anywhere you go. They deliver true high definition fidelity sound. Thanks to the 8.6mm drivers with an incredible mid to high range coverage. In addition to being compatible with all audio devices, you can use the short cord to prevent the wire tangle, especially during sporting activities. Similarly, you can use an extension cable to an earphone for daily activities. The specially designed ear hook allows you to enjoy the customized fit. And through the high definition sound quality, you can be energized by your underwater concert. Little maintenance is required, you just shake the excess water after every swimming session, and be sure that these headphones will remain in use for a long time. The extendable cord is great since you can have a comfortable reach such as when you are listening from a computer placed on a table. Get rid of any distractions and interferences and enjoy great music through Edelin wireless Bluetooth headphones. They allow you to listen to clear audio and outstanding bass as you go through your workout training. Thanks to the CVC 6.0 noise canceling technology which is 100 percent efficient in eliminating ambient or passive noises. Besides, through IPX7 technology, they are 100 percent watertight and the vital components can’t get destroyed even if you were to submerge the earphones for a long time. That’s quite a promising feature especially for all sports guys who really sweat or those who want to enjoy music and still do swimming. And by having a cordless design, they are ideal for jogging, fitness, gym, cross fit, biking among other exercises. By incorporating music into your sporting, you live a better life. Hence Edelin Bluetooth headphones are just but waterproof booster to your active life. It uses Bluetooth version V4.1+EDR which enhance an incredibly long working range. Besides, it uses the CVC 6.0 noise elimination technology so that you can comfortably and efficiently listen to your favorite playlist without being distracted. The good quality and functional design of MorePro Bluetooth Earbuds make it stand out from the rest of the competitive brands. It features a rounded triangular design and has a sleek and smooth design. The controls feature sensitive to touch power on and off and pair functions, making it incredibly easy to listen to music as you go on with daily endeavors. Through the Bluetooth version V4.2+ EDR technology, it is incredibly easy to control the playlist even at a long range of about 10 meters. Also, the noise isolating technology eliminates any passive noise giving you clear and unforgettable music listening experience. And when you combine suit melodies with various workouts, the results are incredibly amazing. More so, it has built-in waterproofing features which allow you to use them outside in the rain as well as use them in the gym despite you sweating profusely. Thanks to the state of the art design of the Earbuds which only allows loud and clear sound out, without letting a single moisture molecule to find its way in. Further, the lightweight and anti-shedding features are great and offer a customized fit to all ear shapes and sizes. It looks ergonomic, thanks to the high PC material and the piano bake paint treatment. Purchase without a doubt that these waterproof headphones will work best for you. Swimbuds Headphones features a patented design that has fantastic built-in features which allow you to enjoy music regardless of where you are, or what you are doing. They are designed to be efficient and effective and allow you to enjoy every swimming session by keeping you thoroughly entertained by your favorite music. It includes an mp3-player which is also built to the same waterproof standards to enhance the continued flow of your favorite music. Thanks to the incredible technology that meets IPX8 waterproofing standards. The kit also includes 8 GB memory card that can hold up to 2000 high-quality songs. Unlike other music devices, those feature no drivers but rather uses USB plug and play feature. The earphones come in a variety of 4 Earbuds tips to ensure you get the best fit. Moreover, it supports both the WMA and mp3 file formats to give you the limitless enjoyment of a variety of songs. With an optional shuffle function, it keeps the music in a mix so that you don’t get bored by a uniform song arrangement every time you play a playlist. The earphones feature a short cord, but you can add an extension cable to enjoy a great reach. You’ll encounter many weather situations when going about your daily life, but that shouldn’t curtail you from enjoying your nice music. 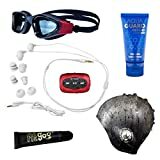 Waterproof headphones are specially designed to counter moisture damage so that you can engage in watersports or gym and still enjoy cool music.